It's sad when a movie that aspires to tell a sad, even tragic, story can't quite connect, and lies there inert on the screen instead of galvanizing or even stirring emotions the way it means to. In this bleak midwinter, a love story of such wrenching facts as are contained in "Summer In February" arguably ought to be a dangerous thing. But "Summer in February", directed by Christopher Menaul from a script by Jonathan Smith, who also wrote the novel of the same name, is an oddly bland vehicle that, once it begins to list in the direction of its unpleasant climactic events, gets woozier and woozier. The story is based on the real lives of several Edwardians, most prominently the British artist Alfred Munnings; Florence Carter-Wood the aspiring artist who was to become his wife; and their friend Gilbert Evans. 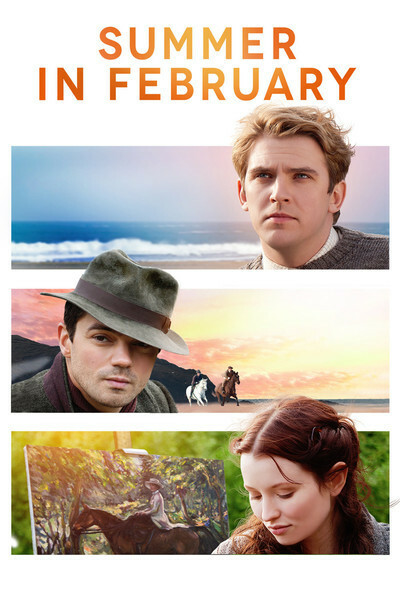 Young, puckish Munnings, played by the energetic Dominic Cooper, is a wild-man painter who declaims poetry in a loud voice before calling for more drinks, ruling the roost in an early 20th-Century artists colony in the raw beautiful seaside of Cornwall. Florence, played by a delicate, tentative Emily Browning, is a delicate plant from a good home who seems to know her own mind but is a little out of her depth with the anti-modernist bohemians she's thrown in with. And Gilbert, a fellow blue-blood played by Dan Stevens, is just a right chap. Seems like a familiar setup, one that in cinema goes all the way back to "Design For Living" if not further: two fellas, pals but diametrically opposed in type, and the one gal who loves them both. But while a love triangle does exist in the movie, one sense here that it's being played up because it's an easier scenario to put across than one concerning a young woman coping with crippling depression in an era when the diagnoses and treatment of that condition were not nearly up to snuff. Yes, every now and then the movie will grapple with this theme, as when Florence is disturbed to see a more free-spirited woman in her circle emerge from seaside foam stark and voluptuously naked, and later strips down before a mirror to regard her own comparatively birdlike (but still lovely) body with palpable sadness. Or later in the film, when Florence complains to a fellow (male) artist that she can't continue painting, and he shrugs her off with a brusque "yes you can." The rest of the time, though, the movie insists on viewing Florence's condition through a conventional lens of romantic confusion and this feels both forced and false. While the movie features very attractive cinematography and a cast that is pretty clearly invested in conveying something substantial, the movie as it's put together can do nothing but sound a row of overly familiar notes, and do so rather weakly much of the time. Which in itself, as I said, is pretty sad.